Jumping back into its undisputed role as one of the leading purveyors of fighting games, Bandai Namco is hard at work putting the finishing touches on the upcoming crossover jamboree Jump Force. Developed as an homage to the 50th anniversary of long-running Japanese weekly manga anthology Weekly Shōnen Jump, Jump Force features a treasure trove of characters from various mangas having starred in the best-selling magazine over the years. Weeaboos and more collected fans of Japan’s rich manga output alike will rejoice at jumping into a game seeping with such pedigree and bombastic head to head combat. What do we know so far and when can we get our hands on Jump Force? Find the answers to all your burning questions below. 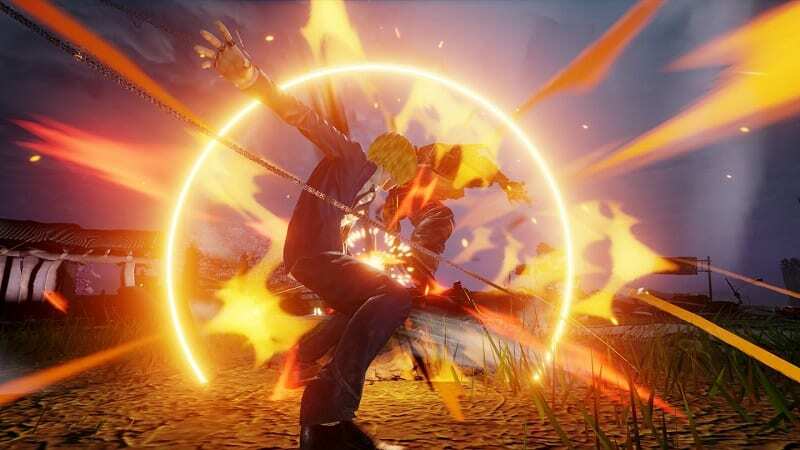 Players can dive into the fighting antics of Jump Force from February 15th, 2019. 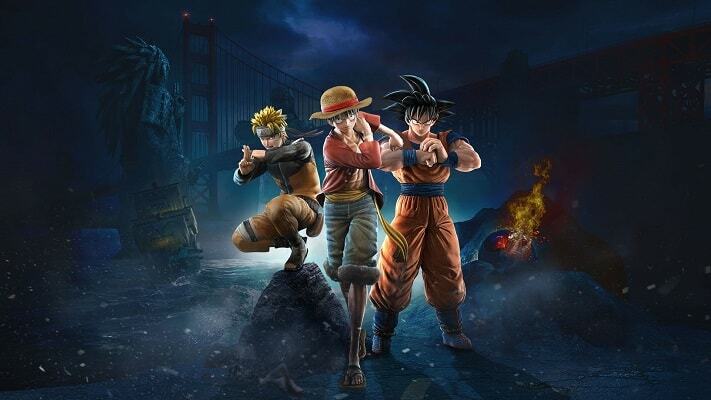 Bandai Namco unveiled Jump Force as recently as E3 2018, while the release date got confirmed at Paris Games Week in October 2018. Jump Force is currently confirmed for PlayStation 4, Xbox One, and PC, with a Switch port likely to see the light of day further down the line (in a similar fashion to Dragon Ball FighterZ), but noticeably absent at launch. Sadly, a closed beta that ran during the second half of October 2018 is now done and dusted meaning the chance of anyone sampling the game in the interim is pretty slim. Interestingly, Bandai Namco only ran beta sessions for the console versions of Jump Force with a PC test run nowhere to be seen. Should Bandai Namco and developer Spike Chunsoft decide to stage further stress tests, it might be worthwhile putting your hand up in advance via the signup form on Bandai’s official Jump Force website. Bandai Namco confirmed the game is penciled in for DLC content via the Characters Pass with no less than nine additional characters already announced, cosmetics for each character, and a four-day head start on playing them in-game. 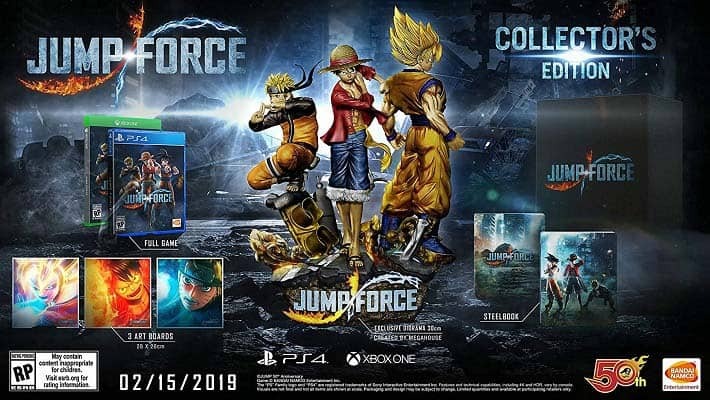 Alongside the Standard Edition of Jump Force, Bandai Namco is flogging a Collector’s Edition featuring an exclusive diorama model of Goku, Naruto, and Luffy as well as a steel book and three artboards of the very same characters. The Ultimate Edition ships with the game, the Characters Pass, an exclusive Jump Start pack, 16 avatar t-shirts, and 3-day early access pass. The Deluxe Edition includes the game alongside the Characters Pass. Anyone who jumps on the physical copy pre-order receives the Frieza’s Hover Pod lobby vehicle and three exclusive costumes, while a digital pre-order combines the above with two avatar t-shirts. Bandai Namco published the first trailer in tandem with the announcement of Jump Force at E3 2018. 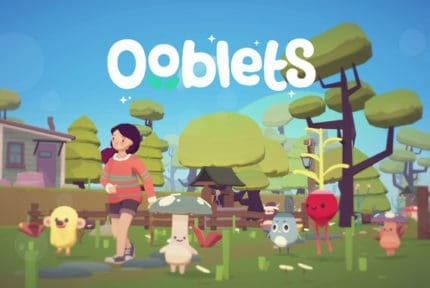 At Gamescom 2018, the publisher unveiled a further trailer alongside what was called a ”Gameplay Mashup”. Jump Force also popped up at the Tokyo Game Show 2018 with a trailer appositely depicting a fight set at Himeji Castle in Japan. 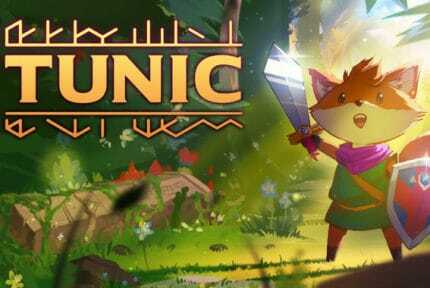 In keeping with wanting to seemingly make an appearance at every game conference this side of E3, Bandai Namco also cooked up an exclusive trailer for Paris Games Week 2018. Following the trend of real-world location specific nods, the trailer takes place in Paris. Interspersed between these general trailers, Bandai Namco also orchestrated the periodic release of character trailers staging gameplay. Here’s a list of the characters currently confirmed to feature in Jump Force. Naruto: Sasuke Uchiha and Naruto Uzumaki. Dragon Ball Z: Vegeta, Frieza, Cell, Piccolo and Son Goku. One Piece: Monkey Luffy, Sabo, Rorona Zoro, Vinsmoke Sanji, and Blackbeard. Yu Yu Hakusho: Yuske Urameshi and Younger Toguro. Hunter x Hunter: Hisoka Morow, Kurapika, Killua Zoldyck, and Gon Freecss. Bleach: Ichigo Kurosaki, Sosuke Aizen, and Rukia Kuchiki. Saint Seiya: Dragon Shiryu and Pegasus Seiya. Death Note: Light Yagami and Ryuk (as non-playable characters). Alongside these manga staples, Jump Force incorporates a selection of original characters created specifically for the game including Kane, Galena, Glover, and Navigator. 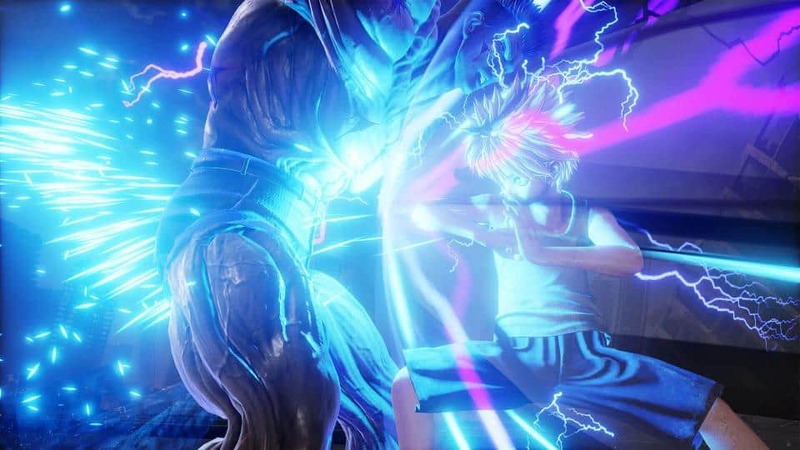 Fighting in Jump Force is set to take place on real-world stages alongside locations from the manga in the game. We currently have the following locales confirmed from trailer footage with more to feature in the final product: Paris, the Matterhorn, Himeji Castle, Golden Gate Bridge, and Hong Kong. At the core of Jump Force is a story of the real world merging with the manga world, causing devastating destruction and an apocalypse of sorts. The various manga characters stand as the last bastion of hope between extinction and survival. As is always the case, a group of villains known as the Venoms headed by Kane stands in the path of our band of heroes. Further details are hard to come by other than fan theories, but given we are talking about a fighting game here, the story won’t be the grand narrative of an RPG epic, but sufficiently crafted to string out a decent story mode. As an arena brawler, Jump Force has a three vs. three tag team format where one character fights from each team at any given moment before handing over the reins to the next hero in line. All three share the same health bar meaning the need for different abilities and tag combos will trigger changes rather than winning or losing a round. Each character has a defined set of skills from ranged attacks to up close and personal melee moves, including unique abilities molded on in-manga abilities. Certain characters have ”Awakenings” – abilities that allow them to transform and shift into different forms. For example, Super Saiyan and Sage mode for Goku and Naruto respectively. The fighting is fast-paced and visually explosive with all manner of effects linked to abilities and moves for a kaleidoscope of furious action. In a departure from traditional fighting game etiquette, the camera angle centers behind the character and remains auto-focused on the opponent. Due to the large size of the stages, characters are endowed with a defacto dash ability to reduce the gap between them and opponents. The environments also feature large-scale destructible elements and character clothing will show visible signs of wear and tear as they sustain damage. Players can also create their own unique avatars from a set of customizable options and then put them to the test in-game. 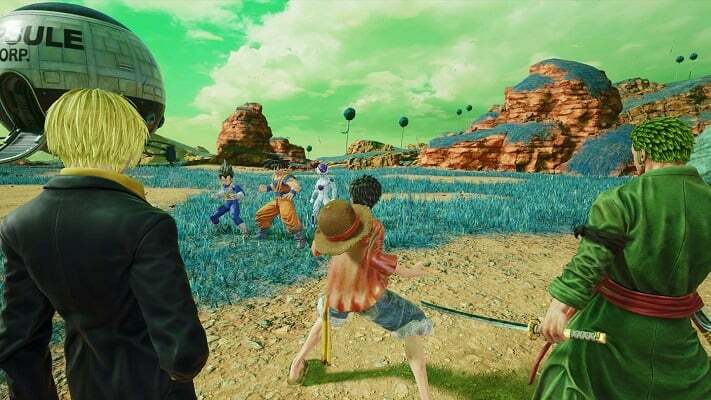 Jump Force looks to scratch the itch of fighting game fans and regaling manga enthusiasts who dream of playing their favorite iconic characters; however, it must be said that gameplay borrows heavily from Dragon Ball Z: Budokai Tenkaichi (also developed by Spike Chunsoft), another historical stallion of Bandai Namco’s brimming stable of fighting games. Will Jump Force provide enough variety to warrant an AAA price tag, especially as its most direct contender, Dragon Ball FighterZ, is only a year old? On the surface, Jump Force appears geared to the casual fighting game fan with a lot of unskilled button mashing, while Dragon Ball FighterZ is the connoisseur brawler by definition with lashings of depth and complex mechanics. As it stands, Jump Force is on a course to celebrate Weekly Shōnen Jump‘s half-century of existence in effervescent style.